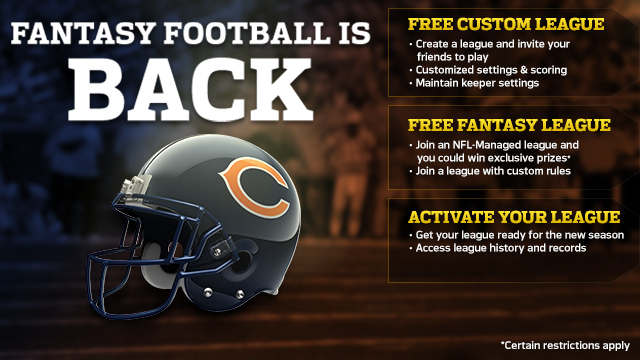 Received a Fantasy Football Invite? Fantasy Football on the go as you know it will change forever after using the new NFL.com Fantasy mobile apps. Both fast and free, join a league in under 2 minutes or create a custom league to play with friends. The choice is yours. Drafting your team is easier than ever with the all-new mobile draft client. What are you waiting for? Stay up to date with the exclusive league feed. Easily set your lineup, sign a free agent or propose a trade. Anytime. From anywhere. Bring your fantasy experience to life with in-game video highlights delivered to you as fast as the players on the field. Only on NFL.com Fantasy. Do you have what it takes to put together a winning football franchise? NFL.com Fantasy Football gives you the perfect chance to find out. Fantasy football, like other fantasy games, puts you in the front office and on the sidelines as General Manager and Coach of your team. You select from a list of the best players in the NFL and they compete on a weekly basis for your team. Their on-field performance drives your fantasy point total and overall success. Specifically, fantasy football works like this: You decide what type of league you want to participate in, acquire a roster of players (either through a draft or through autopick assignment), then set your lineup each week during the season and watch as touchdowns, field goals, yards gained, sacks, interceptions and much, much more generate fantasy points for or against your team. Whether you win or lose and climb or fall on the leaderboard all depends on how well you maximize the talent on your roster each week. Will you make a risky move to start that backup running back or will you play it safe and keep your starting lineup consistent?. From prize-eligible NFL-Managed Leagues to fully customizable Custom Leagues, NFL.com provides ample options to start your fantasy season. Want to compete to win official NFL prizes including trips to the Pro Bowl and Super Bowl XLIX? Join an NFL-Managed league, where you will go head-to-head against other NFL fans across the country for the right to be called a league champion. Or are you looking to fully customize your fantasy experience, from the league and scoring settings to the users you will compete with on a weekly basis? Create your Custom league today and invite friends, family, co-workers and anyone else to compete in a season-long fantasy battle on NFL.com. Exclusive NFL.com Fantasy Football features including instant video highlights and free Fantasy Game Center Live Scoring await in all NFL.com fantasy leagues..
Will your team earn the title of NFL.com Fantasy Football Champion this season? Find the right settings to suit your interests and start building your winning franchise today!. WHY CHOOSE NFL.COM FANTASY FOOTBALL? If you want football, then go to the NFL. You will experience the ONLY fantasy football game with exclusive NFL access through Instant Video Highlights, SAP Player Comparison Tool, and more. NFL.com Fantasy Football brings you closer to the sport you love, because here at the NFL, football is all we do. NFL.com Fantasy Football features two league types for users to choose from -- NFL-Managed and Custom. All NFL.com Fantasy Football leagues feature official NFL stats, video highlights, enhanced gameplay and exclusive features you will only find in the official Fantasy game of the National Football League. Choosing the right league is an important first step to an enjoyable season. NFL.com Fantasy Football offers various league types that cater to Fantasy Football veterans and rookies alike. If you want to join a standard fantasy football league to compete against similar fans and compete for great NFL prizes, an NFL-Managed league may be right for you. If you prefer to join or create a customizable fantasy football league to compete against friends, family, and other NFL fans, a Custom league may be right for you. Read the descriptions below to learn more and decide for yourself which league is the right choice for you. NFL-Managed leagues feature NFL.com default scoring and league settings, including standard roster sizes, starting positions, and head-to-head scoring. All NFL-Managed leagues are free to join and team owners can opt-in to be eligible to win great prizes based on their season performance. NFL.com will act as league manager for NFL-Managed leagues, ensuring a fair, fun game for fantasy players of all skill levels. Users can join either Live Draft NFL-Managed leagues from the League Directory or create an Autopick team that will be placed in a league and drafted when you are ready. The following is a partial list of NFL-Managed league features. Custom leagues feature more than 200 customizable scoring and league settings and are managed by one of the players in the league (known as a League Manager). The League Manager can select the default scoring and league settings or choose to customize the game according to their preferences, including Individual Defensive Players, Keepers and much more. The League Manager will be responsible for inviting other team owners to the Custom league and also has the option to publish the league to the NFL.com Fantasy League Directory, where NFL.com fantasy players can browse and join leagues that look like the right fit. The following is a partial list of Custom league features. A draft is one of the most important (and fun!) aspects of playing Fantasy Football. Whether you want to practice your skills in an NFL.com Mock Draft or pre-rank your targeted players with information from the NFL.com Draft Kit, NFL.com has the information to make sure you are prepared from start to finish of your Fantasy Draft. There are three easy-to-use Fantasy Draft types on NFL.com Fantasy Football: Live Online Draft, Autopick Draft and Offline Draft. The Live Online Draft feature allows you to select a full fantasy team, LIVE, round-by-round in an interactive environment. The draft client features comprehensive stats, analysis and chat functionality, all packaged in a user-friendly interface. In this draft application you will be able to rank your players in real-time, adding them to a queue that will update as players are taken by other teams in the league. You have the ability to search for players or filter the available players by position so that you can make fast, easy and informed decisions to fill out your roster. When you have found the perfect selection, and it's your turn to draft, click “DRAFT NOW” and the player you selected will be assigned to your team. You will be able to track all of the action by round and by individual team, all in one place inside the draft application. Can’t make the start of your live Draft? Have to step away from your computer for your fifth-round selection? No problem. In the NFL.com Live Online Fantasy Draft you can select the “Autopick” feature, which will strictly follow either your established queue of pre-ranked players, or select for you in your absence based on NFL.com's Fantasy rankings. Either way, you will have full ownership of your team after the draft and can make the trades, adds, and drops to craft your team exactly how you prefer. The NFL.com Live Online and Autopick Drafts operate with either a “standard” or "auction" draft format. Standard - Standard drafts can either be "snake" or "linear". This means that either the draft order reverses at the end of each round (snake) or the draft order remains the same (linear) after each round. Each team has a certain amount of time to make their pick before the next team is on the clock. Auction - Each team takes a turn nominating players. When a player is nominated, each team can make a bid on the player. The team with the highest bid wins the player. Each team has a budget that determines how much they can spend on nominated players. The NFL.com Live Online and Autopick Drafts operate with either a “snake” or "linear" drafting order. Snake - The team with the first overall pick selects, followed by the team with the second pick, third pick, and so on. At the end of the first round, the team that just drafted (with the last pick in the first round) will have the first pick in the second round, as the draft order reverses until the end of the second round sees the team that originaly drafted first overall makes another selection. Linear - The team with the first overall pick selects, followed by the team with the second pick, third pick and so on. The draft order that is established in the first round will be the order that picks are selected throughout the entire draft. In other words, the order in the first round is used in all rounds and never changes. The draft order is reflected at the top of the Live Draft application (Live Draft only) and will also be featured on your Draft Results page accessible from your League homepage after your draft is complete. The Autopick Draft operates based on NFL.com Fantasy experts default rankings or a team owner’s established pre-rankings. This draft type is an excellent choice for both beginners as well as leagues that can’t agree on a live draft time. In an autopick draft, players are assigned to your team automatically. NFL.com helps you fill your roster either by going strictly off your Pre-Rank Draft list and Excluded Players list or by selecting the best available player at an open position of need on your roster. Select a day and time for your autopick draft and that is all you need to produce a league full of fantasy teams for each owner to manage as they see fit. The NFL.com Live Online and Autopick Drafts operate with a “snake” or "linear" drafting order for standard drafts. For auction drafts, the nomination order is always "linear". A "snake" drafting order means the team with the first overall pick selects, followed by the team with the second pick, third pick, and so on. At the end of the first round, the team that just drafted (with the last pick in the first round) will have the first pick in the second round, as the draft order reverses until the end of the second round sees the team that originally drafted first overall makes another pick. This process repeats until all teams have filled out their rosters. The snake draft order helps ensure fairly balanced teams - whether you are the first overall pick or the last, all teams will receive equal number of picks and will have advantages during various rounds of the draft. The draft order is reflected on the left side of the Live Draft application (Live Draft only) and will also be featured on your Draft Results page accessible from your League homepage after your draft is complete. The Offline Draft is a draft type in which the League’s teams draft their players without use of the drafting tools provided by NFL.com (Live Draft client, Autopick option, or Pre-Rank Lists). Whether the draft is held in a conference room, restaurant, basement, backyard, on the phone, or by e-mail, the Offline Draft offers additional draft flexibility for fantasy fans. Once your league’s rosters have been finalized, the League Manager must enter in the draft selections into the “Edit Draft Results” page, which can be found on the “Manage” tab of your NFL.com Fantasy Football league. Once everything is entered, your league is eligible to execute all normal NFL.com Fantasy functions, including add/drop, trades, set lineup, etc. Note that when you are entering your Offline Draft, all roster spots must be filled on each team before you can start the season. There can be no open roster spots or the season will not begin. What is the difference between a Standard draft and an Auction draft? Other than a Live Online Draft, are there additional draft options? How do I know my league's draft date and time? How do I know my league's draft order? What happens if I can't make my live draft? How can I practice a live draft? How can I test if my computer supports the NFL.com live draft client? How can I prepare for my draft? NFL.com now offers both Standard and Auction drafts! A Standard draft follows a "snake" drafting order. This means that once each team makes a pick, the draft order is reversed in the next round. Each team drafts a player when they are on the clock. In an Auction draft, players are nominated in a "linear" order. This means that nomination order never reverses but always remain the same. In an Auction draft, players are nominated and teams can bid on that player. Each team has a budget that they can spend to win nominated players. The highest bidder wins the player and the amount that they won that player for is deducted from their budget. NFL.com offers both NFL-Managed Standard and Auction leagues as well as custom Standard and Auction leagues! We understand that a Live Online draft may not be for everyone. NFL.com also offers Autopick and Offline drafts to ensure every fantasy manager can draft his or her preferred way. An Autopick Draft operates based on NFL.com Fantasy experts default rankings or a team owner's established pre-rankings of players. This draft type is an excellent choice for both beginners in the fantasy game as well as leagues which can't agree upon a live draft time. In an autopick draft, players are assigned to your team automatically: the system helps you fill your roster either by going strictly off your preset player rankings or by selecting the best available player at an open position of need on your roster. An Offline Draft is a draft type in which the League's teams draft their players separately from NFL.com. Whether the draft is held in a conference room, restaurant, basement, backyard, on the phone or by e-mail, the Offline Draft is for users who choose not to use the free NFL.com draft application. The League Manager will be responsible for entering draft results via the "Submit Offline Draft Results" tool in the Draft Management section of League Manager Tools. When you join or create your league, you are able to view or select your league's draft type, date and time. You can also confirm your league's draft settings via the Settings link on your League homepage. For Live Drafts, your league homepage will display a "Drafting Now" graphic and link 30 minutes prior to your draft. Once you enter your live draft, the countdown clock will update you on the draft status and when you are on the clock. Your draft order is set prior to the draft according to league settings. In NFL-Managed leagues, the draft order is randomized and you will discover your draft order once you log in to the Live Draft client. In Custom leagues, your draft order will either be randomized or set by your League Manager. If you are unable to attend your league's scheduled live draft, don't worry. Your team will still be drafted according to the Pre-Draft Rankings you specify or the default NFL player rankings. To customize your Pre-Draft rankings, visit the Pre-Draft Rankings tool from your My Team page prior to your league's draft. NFL.com Fantasy Football offers Mock Drafts from June through September to practice your Live Draft skills. NFL.com Mock Drafts will return next season. Test the Draft Client by clicking here. NFL.com is a great source of fantasy football information, including breaking news updates, video highlights, player rankings and draft predictions. Michael Fabiano and the NFL.com team make sure to always keep you in the know and ahead of the competition. Visit https://www.nfl.com/fantasy to get your draft research started today. Visit the NFL.com Fantasy Help section - Live Draft Application for additional information about drafting your team.